The many excuses for yet another War! 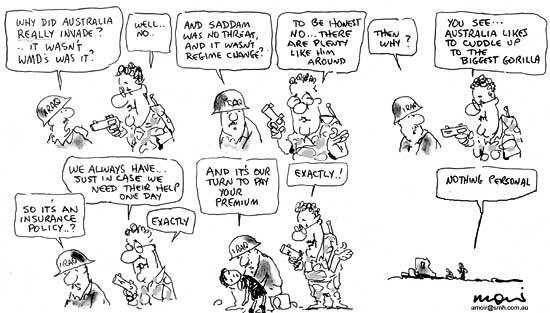 The “War on Terror” conscripted Australia into a prolonged battle on the other side of the world which – despite the protests of thousands of Australians –our PM, John Howard, threw soldiers and armaments (often bought from America) into it. The mythology of “Weapons of Mass Destruction” – long since repudiated – was the justification for this expensive foray into supporting the American War machine. There were other reasons of course. Aren’t there always. 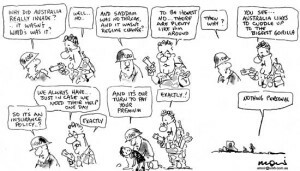 <sigh> Australia under the next Liberal PM, Tony Abbott, once again commenced sending planes and weapons (bought from America) into an insanely expensive foray into attacking ISIS in Syria, yet again in support of the American War machine which generated the ISIS battle ground because of its initial war in Iraq. In a never ending circle, we will perpetuate this war mongering and create the next generation against which to fight the next war. The middle East has been a target for Western Democracies ever since supposedly they attacked our allies, the Americans, a decade ago. Though some would suggest, it goes back even further, for now, I will focus on the common perception. Interestingly, the attack of 9/11 was predominately carried out by nationalities of other allies of America – Saudi Arabia. Yet it was Iraq, Afganistan, and Syria that feel our guns upon their backs. 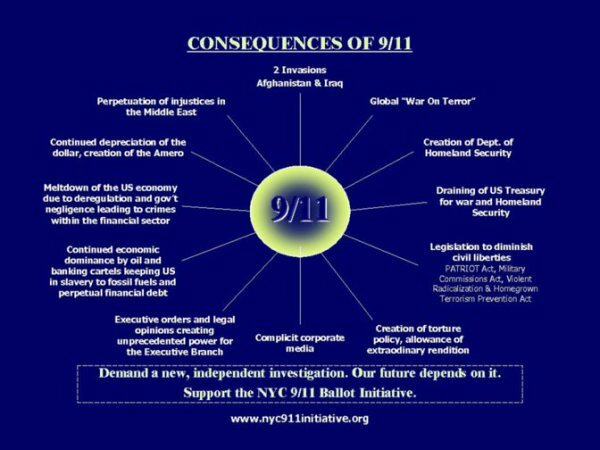 There is much about the 9/11 story from start to finish (which I doubt we have seen yet) that is a story of considerable inconsistencies. As we have been instigators of and cooperative in, this “War on Terror” for the last decade, it behoves us to question the origins of this involvement in American propaganda and war. A decade has passed since 9/11, and yet now a vast number of Americans & others seek a re-evaluation of the FEMA & NIST Investigations into the incident. Some suggest public discussion of the destruction of the three Trade Center buildings did not occur in a scientific context, but in a highly charged political context. 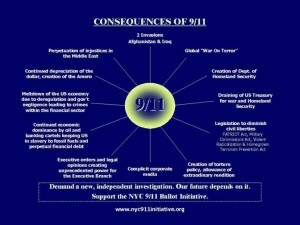 I spent time some months ago gradually watching an excellent documentary film by “Architects & Engineers for 9/11 Truth!”. It concerns itself with the scientific context and does not speculate on the who or why which I find pragmatically relieving. It examines issues with the FEMA & NIST Investigation reports. It’s a 2 hour documentary of interviews with engineers, architects, and at the end clinical psychologists because it inevitably needs to deal with the issues of cognitive dissonance that arise. Despite the publicity, the very public nature of the event, the film footage, the investigations officially and unofficially, it remains an event in which misconceptions exist no matter what side of the arguments is peculating around the event you sit on. For myself the scope of the destruction is intriguing. It is often discussed regarding the two buildings which were hit and not the collateral damage. 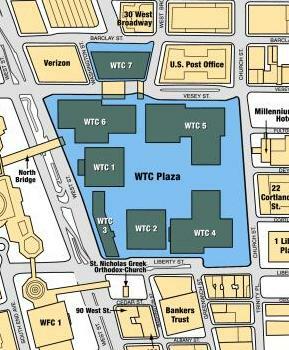 Although Building Seven across the street from and separated from WTC 1 by yet another building, generates an enormous amount of controversy. The thing about it all was that a total of seven World Trade Center buildings were ultimately destroyed but only two hit by planes. Yes, there was “collateral damage”. 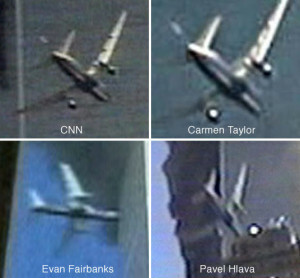 Two planes ran into the 110-story WTC 1 and 2. The 47-story WTC 7 across the street was suddenly leveled to the ground in seconds after what appeared to be spot fires (depending on whom you talk to). It’s collapse, and the speed and nature of its collapse are the single most pointed exception that everyone brings up in defence of something dodgy being afoot, to the alternative being that this is merely collateral damage from the foreign attack. There are plenty of sites attempting to debunk the conspiratorialists claims about WTC 1 and 2. The 47-story WTC 7 collapse just doesn’t “sell” as well for they who justify it, having just happened to collapse naturally, despite never having been hit. It’s always the one the anti-conspirators shy away from or deal with in very perfunctory terms. In fact, it isn’t even mentioned in the 9/11 Commission report. Collateral Damage to WTC 3, 4, 5, and 6 was suffered as large portions of WTC 3, 4, and 6 were also crushed. Then there were the peripheral buildings outside of the “zone” that was damaged and subsequently torn down. The nature of which buildings fell or were later demolished is, in of itself, concern for much speculation. Manipulated image or just poor, inadequate cameras with a lossy compression algorithm? Having suggested there is a conspiracy afoot, it is also evident some of the conspiratorial claims are clearly more obviously nonsense. The one’s that immediately come to mind, from my perspective of a film maker. There is the folk who suggest it wasn’t a real plane based on footage presumably sourced from a consumer quality camera with undoubtedly a small CMOS chip and limited focus capacity, that was taken by folks in New York with a camera handy. The other claim is often that the footage was faked and not made by the citizenry. More likely the footage is probably real but suffers from the problem all such small consumer cameras suffer from – compression technology. A small lesson in the manner in which pixel capture occurs would be useful. The compression algorithm inherent in most consumer cameras from a decade ago explains more than an examination of each supposed frame of the collision does. Subsequent image frames from such cameras are never full frames. Sometimes only one frame in 25 might capture the full image as each subsequent frame captures only a fragment of what the lens sees to reduce the otherwise large file size nature of what the video file would otherwise be. When a camera only records limited pixels each frame and the only full frame capture being what is known as an “iframe” (or full frame) then what you play back, is inevitably not what happened. These cameras are not designed to be examined frame by frame because they don’t store data that way. They are intended to be watched as running moving images to fool the eye that we are seeing “moving full frame pictures” when we are doing nothing of the sort. Add to that, that you are filming through a tiny lens with a small charge-coupled device (CCD) or more likely CMOS chips for most consumer cameras. The CMOS converts the visual data via an algorithm/codec (generally DV, MPEG-2 or AVCHD) to be compressed before it’s recorded to whatever media the camcorder is using, be it tape, a hard drive, a disc, or a memory card. Most of the data collected by the CMOS chip of pixels on each frame is simply lost and never recorded, but enough is retained to create the illusions that you can look at each frame one at a time. Most of the picture is constructed from pixels taken several frames ago with the minimal amount changed to generate the illusion of movement. The plane doesn’t appear to explode at the exact microsecond of an impact because the pixels are not entirely updated till each iframe occurs. Instead what you are looking at is a mathematical extrapolation of changing pixels to generate several intermediary partial frames between each iframe. It’s called lossy compression. Inaccuracy of positioning of visual data is a reflection of weak or small lens (resulting in visual noise and refractive distortion) and CMOS quality (resulting in skew distortions – especially if the subject is moving fast) but not grounds for a conspiracy about absent planes, or badly video edited evidence for a plane’s non-existence or explosions that appear to be “off-centre”. It’s more about the extrapolation of data stored by the inferior camera than grounds for doubting the existence of a genuine film or plane or proof of bad editing. You can look this stuff up yourself. I am not even going to give it credit by providing links. Hardly good evidence to be used to claim conspiracy. On the other hand, more careful and rigorous science and the investigation is applied in “Architects & Engineers for 9/11 Truth!” and no speculation as to responsibility. There is no doubt they have speculated, as many have and still do. How can one not, when faced with the weight of evidence and the dubious way the FEMA & NIST investigation was conducted? There are innumerable videos and commentaries on that and entire lobby groups dedicated to questioning their procedure. Determining what might have happened is a forensic search of shifting through the dust of evidence and that is what this film attempts to do. Not that this proves anything or finds any specific group responsible, mind you. 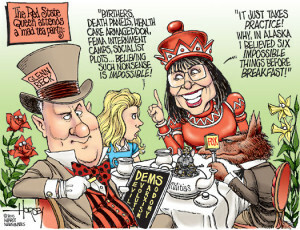 There is an entire community in America represented by the “Tea Party” adherents who believe half a dozen impossible things before breakfast. Often accused of lacking education and rational thinking, the Tea party lobby for “changes” in American infrastructure, medical care and politics based on presumptions about their government and culture outside observers here in Australia might suggest is based on dubious evidence. America abounds in “crazies” in rather unique ways. So if America is the land of the conspiratorial and the paranoid, does this, in itself, invalidate theories that suggest 9/11 is not what it is sold to us as? Logically not, but emotive reactions to the proposal that there might be something to the theories, usually sway one’s beliefs, to ignore evidence to the contrary. To put it in the terms of the classic cliche: “Just because your paranoid, doesn’t mean your wrong!”. The documentary is although worth looking at ( the link here again ), then by all means look at the claims from it’s detractors. It is unlikely that the truth will come out while the possible perpetrators are still alive and possibly are in position to ensure detailed investigations are “delayed” and obfuscated. Misdirection and misinformation are the tools of war as Sun Tzu pointed out and in the battle for the truth for 9/11 we are at war with an unknown enemy who knows this well. In the meantime, whatever your views, the event was a catalyst for innumerable crimes and illegal or dubious forays into the wider world by the American War machine. The death toll of 9/11 pales in comparison to the actions and deaths that were generated by these subsequent events. Irrespective of what you may believe or who you blame for 9/11, it is very clear who was responsible for it’s aftermath. “Truth” is the first victim in this form of war and that is the nature of the world we live in, sadly! » Violent Christian terrorist shoots innocent civilians!